Damaged fuel tanks on the Transocean drilling rig Transocean Winner, grounded in the Isle of Lewis, are reportedly leaking diesel, according to the BBC. The Transocean Winner rig was carrying 280 tonnes of oil, the British Maritime and Coastguard Agency (MCA) said in a statement. “During the inspection, the salvors discovered that two of the fuel tanks appear to have been breached, however it is unclear at this time how much oil from those tanks has been released to the environment,” the MCA statement reads. 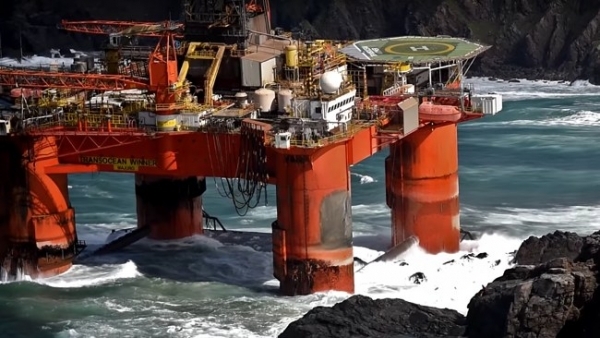 “A damage assessment team from Smit Salvage and Transocean has been on board the oil rig grounded off the Isle of Lewis to carry out a series of initial inspections,” the MCA added. According to the statement, the team spent three and a half hours checking the condition of the rig’s structural integrity. The rig is still in its original position, at Dalmore beach, in the Isle of Lewis, and weather conditions have made it impossible for the team to continue with the assessment today, the MCA explained. “Additional salvors and technical experts from Transocean and also equipment continues to arrive to the incident area to support the operation,” it added. According to the Secretary of State’s Representative for Maritime Salvage and Intervention, Hugh Shaw, there was no evidence of oil around the facility or on the beach. However, monitoring continues from the shore and from the air and counter pollution measures are ready and available in case oil is detected. Still, it remains unclear how much fuel may have been released. In the meantime, bad weather has prevented the inspection team from returning to the rig and a temporary exclusion zone remains in force. The rig, which ran aground on Monday, was being towed from Norway to Malta. Due to bad weather, the tow line may have broken early on Monday. Shaw told BBC Radio Scotland this won’t be a “speedy” operation as the weather conditions worsen and the rig could move further and cause more damage. “We’re not going to risk anyone or any craft going in below the rig until we know it’s safe to do so,” he explained.